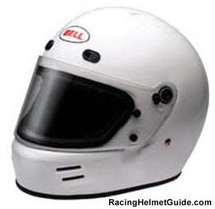 New for 2007, the Bell M4 helmet replaces the outgoing Bell M2 helmet. The M4 picks up where the M2 left off... it is an aggressively styled, Snell SA2005 rated, full-ventilation helmet with an extra large eyeport. The shell is constructed of Bell's Fiber-Tech Composite material and results in one of the lighter fiberglass helmets on the market. The extra large eyeport makes it one of the best choices for those that wear glasses or sunglasses while driving. If you wear, or plan to wear, a HANS® device, the M4's shell is pre-drilled for HANS® posts. Another improvement over the previous M2 model is Bell's new SRV friction shield system.... this new system has a slide mechanism that allows the driver to adjust the tension on the shield allowing for multiple opening positions. When properly adjusted, and in the locked position, the SRV systems helps reduce the possibility of the shield opening during an impact. Additionally, this new shield pivot is a much simpler design and less likely to get damaged during use. Ventilation comes from four slotted vents in the chin bar, two open/close vents in the forehead area, and two top/rear exhaust ports. The fireproof liner on the M4 is a very comfortable Carbon X material. Several color choices are available, including gloss white, gloss black, and flat black. Bell helmets have always been popular with racers and the M4 is probably their best value in a full face Snell SA rated helmet.